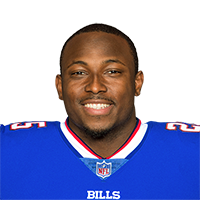 Published: Nov. 11, 2018 at 02:36 p.m.
Buffalo Bills running back LeSean McCoy receives the handoff and pushes his way into the end zone for a 1-yard touchdown. Published: Nov. 11, 2018 at 02:33 p.m.
Buffalo Bills runningback LeSean McCoy shows off his footwork with a nice spin move for a 23-yard gain. Buffalo Bills running back LeSean McCoy receives the handoff and runs the ball through the open gap for a 27-yard gain.